Regret often springs from a sentence common to gardeners around the world: “Oh that can’t be all that heavy!” Having worked in my own garden and the gardens of clients for the last twenty-plus years, I’m here to tell you: yes, it certainly can be that heavy. To work safely in the landscape we should always have a good sense of the materials we’re working with, lift properly, and use the right tool for the job. It’s far too easy to underestimate how much the materials we’re using might weigh. That CMU (aka “cinderblock”) weighs close to forty pounds. 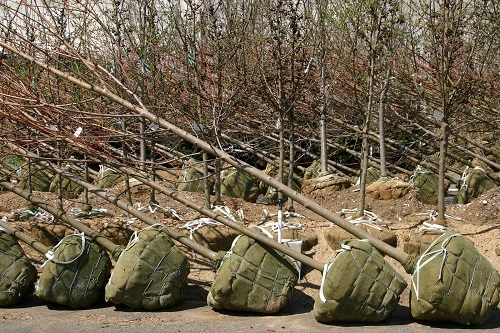 That 3” caliper maple looked all cute and unassuming lined up with its siblings in the nursery. The reality is that the root ball on a tree that size could weigh as much as 650 pounds. Know what you’re moving and guess high when necessary! I’m not a personal trainer but I’ve moved around enough heavy plants and boulders that I can tell you to lift with your legs, not with your back. Lifting and twisting is a bad combination. If you need to pick something up in front of you and set it down next to or behind you, turn your whole body. Don’t just pivot at your waist. Most importantly if you have any doubts about your ability to lift something by yourself, get a buddy to help you. Wheelbarrows have long been a standard tool for moving materials more safely and easily than by hand. The problem is that a six cubic foot wheelbarrow is big. If we’re not accustomed to wrestling one around a job site all day, every day, it’s easy to load it up with more than we can handle. 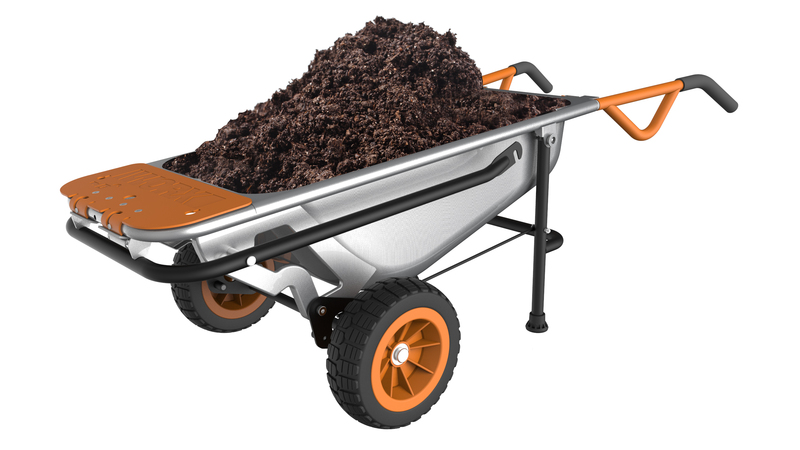 I was surprised when I started doing the math and realized that if you completely fill a contractor wheelbarrow with topsoil you’re pushing around over 300 pounds! It may not feel like it once the wheelbarrow is up and rolling across flat ground, but stopping, turning, and dumping are where you can still run into trouble. That’s why as soon as I saw the AeroCart by WORX I fell in love. It’s ergonomically designed so that it takes less force to get it started. It has two wheels, so it’s more stable and easy to maneuver than a wheelbarrow. Its capacity is about half of a contractor wheelbarrow (approximately 3 cubic feet) but that’s a good thing for me, as making a couple of extra trips is safer for my back. The fact that it also converts to a dolly and small tree cart make it incredibly useful. I can’t wait for the snow to melt so I can use it! Spring is coming, which means we’re all going to be excited to get out and make our yards and gardens perfect this year. Be sure to know your materials, lift safely, and use the right tools and you’ll have a fun, safe year in the garden. I just got my new Aerocart today from Worx, and I’ve moved a boulder with ease, loaded some tree Branches on the front forks moved only 3 loads and filled my utility trailer. This Aerocart does what Worx say’s it doe’s. it took me under 5 min to put it together, I also got the wagon kit too. to put it plain and simple “Worx just work’s” it always does what they say it will do. another great Worx tool I just bought is the Worx TriVac I love that too. but the order I’m still waiting to get just released to the US is the Worx landdroid robotic lawn mower, Can’t wait to get it so I can sit back and watch it do all my mowing for me.